Alright, we’re about due for a Helen update, aren’t we? Prepare yourself for a boatload of photos. Around four months old, I started to teach her to sit up on her own. It was funny to watch her wobble and tip (don’t worry, I caught her). See THIS video. She puts everything she can get her hands on into her mouth. 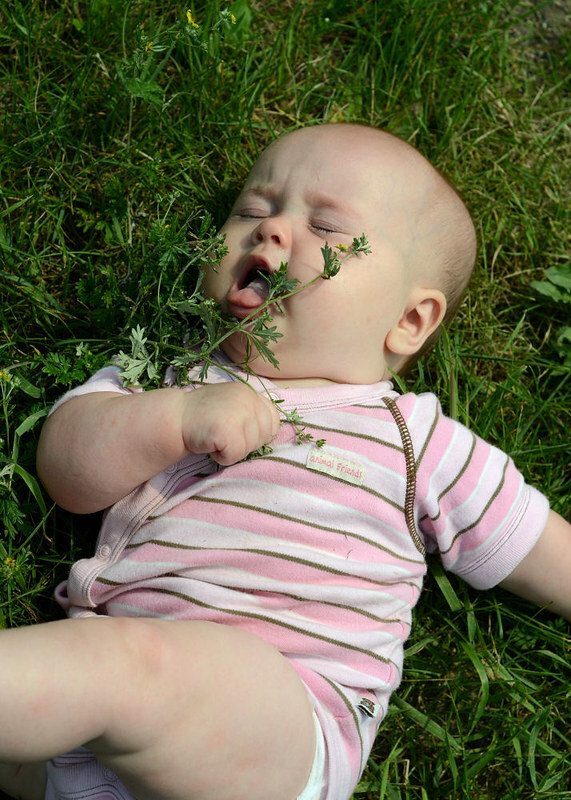 She loves to be outside and play in the grass. She likes bath time again! I think it’s because she can sit up in the water now and doesn’t feel so helpless. Speaking of which, she can sit up by herself really well now. 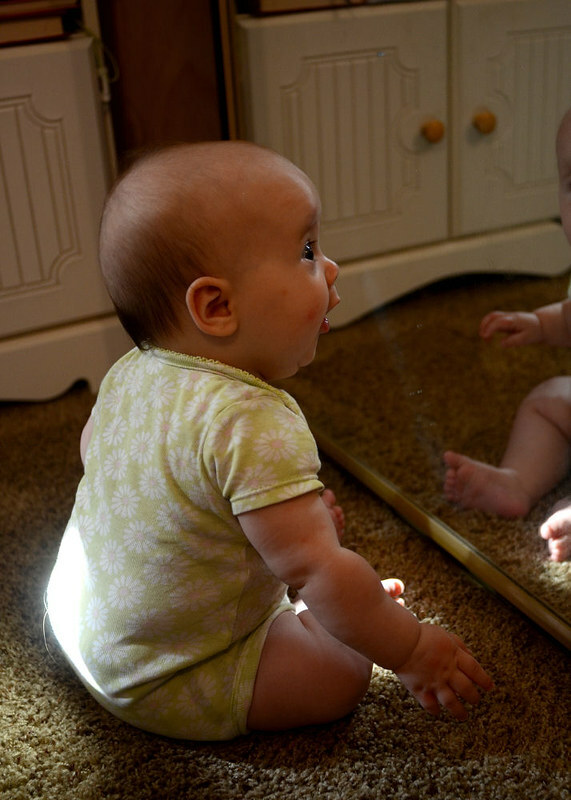 When I started to set her in front of the mirrors in our bedroom she was actually interested in sitting upright. She still topples over sometimes (much to her dismay), but she usually stays upright for quite a while. Wearing Dad’s new hat. She loves to chew on plantain leaves. Helen and cousin Susan were wearing the same diapers, so I had to get a picture. She rolls easily from her tummy to her back and back to tummy (she first rolled over at 13 weeks). She’s on the move! If I set her on the rug, there’s no guarantee that she’ll be in the same spot when I look back — she scoots and rolls to get places. She can get up onto her hands and knees easily now. And she even does a plank sometimes. 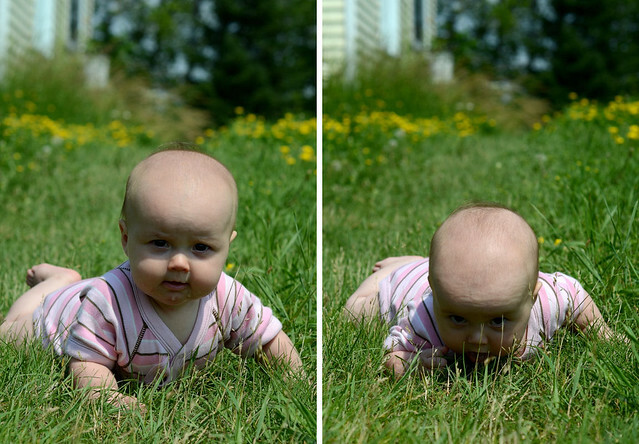 Next step – crawling! She’s in size 3 diapers and weighs in at 16 pounds. She’s down to about 3 naps per day and getting better at sleeping for longer stretches. I’m trying to ease her into sleeping in the crib at night. Still no teeth! But I’m pretty sure they’re working on popping out. She hasn’t had any solids yet, but I’m thinking about giving her a little taste soon – she’s pretty interested in food and looks longingly at whatever I eat. All right, that’s all I have for now. When my little guy was about 6 months old (he is 2 now) and could sit up, he loved to play in the kitchen. I’d give him some pots and spoons etc and he’d be happy for up to 30 minutes! He also liked sand boxes. Hope this helps! Helen will probably be so much happier when she can crawl! Opens up their little world so much! My 5 month old loves to be in her baby pool. It’s the perfect size and she’s happy for about an hour. 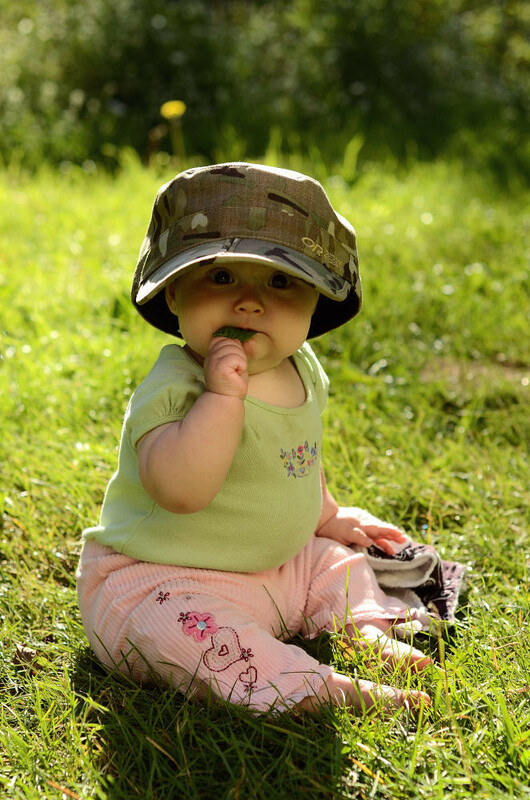 She loves to splash around and hang her arms over the sides to pull on the grass. She also loves her jumper. I put it in the doorway going out to our deck and that way she’s “outside” and entertaining herself. 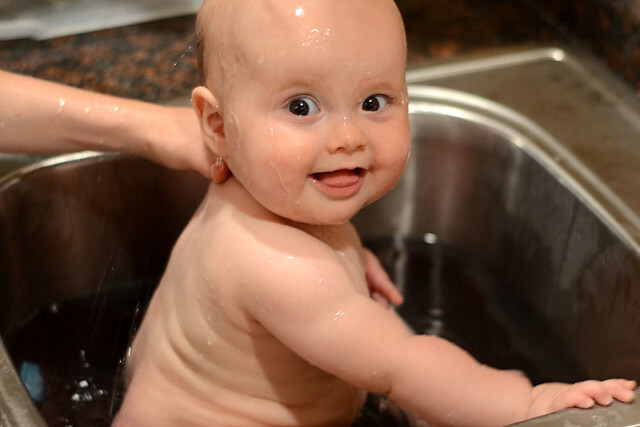 Playing with pots and pans and the baby pool are both wonderful ideas. My daughter loves to “cook” with me while I’m working on things in the kitchen. Does Helen have a jumper or exersaucer? Don’t be afraid to utilize those things! No guilt. You can’t entertain Helen every single second. I would put my babies in the exersaucer right after breakfast and clean up the kitchen right away, and I never kept them in longer than 1/2 hour at a time, but sometimes you just really need for them to be okay on their own and safe at the same time so you can get something done or have a cup of tea that hasn’t gotten cold. If she’s not accustomed to it, she will not be pleased at first, but try working your way up to it. Try 5 minutes, then 10. I also kept the baby’s little toys in frequent rotation during “floor play” time for more variety. I hope this helps! I agree with Grace; Helen will probably be much more content once she learns to crawl- it really is a whole new world for them! Grace: Thanks so much for the advice! I’ve been letting Helen bang on pots, and she loves it! See THISvideo. :) Yes, I think once she can crawl she’ll be much happier – she just gets SO frustrated when she can’t reach her toys. JMN: I’ll have to keep my eye out for a set – I’ll bet Helen would like those. I’ll be posting some of my favorites from Cooking for Seven, but I’ve moved the old recipes to THIS website. Sorry for the inconvenience! I second the jumper! Boy, has it been a lifesaver when I need free hands. Also, my 8 month old really enjoys anything she can roll back and forth — plastic or squishy balls are great. Helen will be crawling before you know it!